MANHATTAN, NY – According to Pew Research Center’s 2017 survey of Muslim Americans, Muslim Americans are concerned about their place in American society, but they continue to believe in the American dream. The Pew Research Center is a nonpartisan fact tank that informs the public about the issues, attitudes and trends shaping America and the world. It conducts public opinion polling, demographic research, media content analysis and other empirical social science research. “Overall, Muslims in the U.S. perceive a lot of discrimination against their religious group, are leery of President Donald Trump and think their fellow Americans do not see Islam as part of mainstream U.S. society,” the Pew wrote in their report. In its study, the Pew surveyed a nationally representative sample of 1,001 Muslim adults by telephone between January and May 2017. Muslim Americans are estimated to be 3.35 million, roughly 1% of the country’s population. Most of this minority group living in the U.S. are immigrants or the children of immigrants, 58% and 18% respectfully. Pew’s survey results showed that the number of Muslim Americans who have experienced discriminatory treatment is trending upward, with 48% of respondents saying they were subjected to at least one discriminatory incident based on religion over the past 12 months, compared with 40% a decade ago. Additionally, PEW reported that in the past year, 32% of Muslims have been treated with suspicion at least once (up from 26% in 2007), 19% have been called offensive names, 18% have seen anti-Muslim graffiti in their local community, and 6% reported they were physically threatened or attacked. Discriminatory treatment was especially common for those whose appearance identified them as Muslim. For those whose appearance suggested that they were in fact Muslim, 64% reported that they have experienced at least one of the specific types of discrimination asked about in the PEW survey. Moreover, nearly two-thirds of those surveyed said they think that the American public does not accept their religion as a part of mainstream society. One immigrant Muslim man told PEW that Trump’s 2017 “Muslim ban” felt like the official launch of a campaign of anti-Muslim persecution. There is good news. Muslim Americans express continued optimism and positive feelings despite the hostility and ignorance around them. 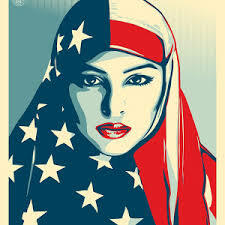 Despite the direction of the country as a whole, a majority of Muslim Americans reported that they are proud to be Americans, they believe that hard work generally brings success in the U.S., and they expressed satisfaction in their personal lives in the U.S.
Additional good news from the PEW report, 49% of Muslim Americans say in the past 12 months someone has expressed support for them because they are Muslim. This number is growing, up from 37% in and 32% in 2007. In the work environment, religious discrimination involves treating an applicant, or employee unfavorably because of his or her religious beliefs. The Federal law protects not only people who belong to major organized religions, such as Buddhism, Christianity, Hinduism, Islam, and Judaism, but also others who have sincerely held religious, ethical or moral beliefs. Furthermore, religious discrimination may involve discriminatory treatment of a person who is married to, or associated with an individual of a particular religion. For those living in the State of New York, or New York City, there are additional protections. The experienced New York City sexual harassment attorneys at the Derek Smith Law Group, PLLC have years of experience litigating claims of gender discrimination. Working together with our Philadelphia sexual harassment attorneys, we have recovered millions on behalf of our clients who were discriminated against because of their gender. If you feel you have been discriminated against because of your gender, please give our attorneys a call, toll free, at 1877 4NYLAWS, for your free consultation.